Estella's Revenge: Oct. 15 Dewey's Readathon Master Post! 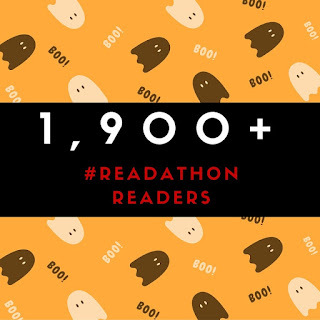 Oct. 15 Dewey's Readathon Master Post! 1. What are you reading right now? Still reading The Quick. It "stuck" better than Warm Bodies. I've read about 100 pages of it, plus 50 of Warm Bodies, so not too bad for me on a busy readathon day. I'll probably switch to Jem and the Holograms comics later. 3. What book are you most looking forward to for the second half of the Read-a-thon? See above. Jem is truly outrageous. Yeahhh, stopped to eat, visited with my mom, and I did some prize wrangling. I still need to CHEER! David crock-potted some salisbury steak for dinner and we paired it with mashed potatoes and spicy pickled okra. 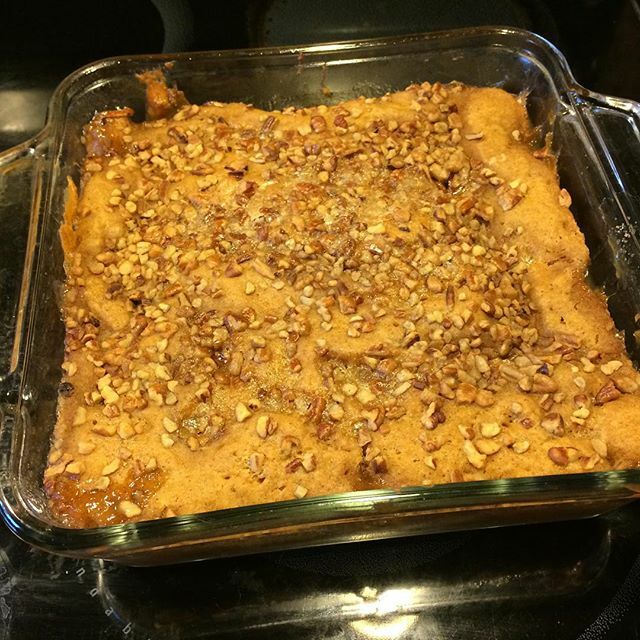 That pumpkin pecan cobbler up there was dessert...with ice cream, of course! How does it go so fast? I spent the morning cheering, Tweeting, keeping up with prizes and the other things that go along with Readathon. I also stole away for a meal of fajita breakfast tacos and a power nap, and now I've spent some time with Warm Bodies by Isaac Marion AND The Quick by Lauren Owen. So far I'm getting on better with The Quick, so I'm rolling with it! Just wish this didn't-get-enough-sleep headache would go away! There may be more napping in my future. My view for the morning. 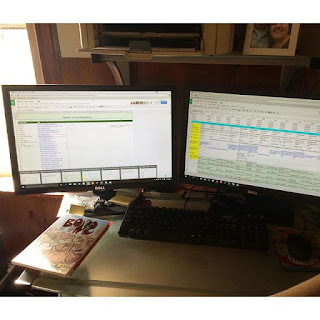 Spreadsheets and more spreadsheets. Whew! Got some coffee in me, and all is right with the world. Unfortunately the initial permalink to the Reading Rainbow Challenge was broken this morning, but Heather and another wonderful helper (Kerry!) helped run through ALL 24 HOURLY POSTS and update the links right quick. Readathon is so much easier with enthusiastic volunteers. We love you! 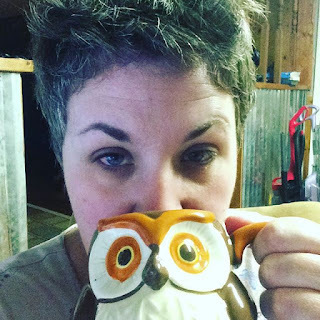 Me, owling the coffee this morn. Pre-Readathon (3:30 a.m. to 6 a.m.): Woke up way too early, but I'm stoked! We're hovering on the edge of 1,900 readers, so I know we're going over! So many choices! I'm definitely looking forward to reading more of The Quick by Lauren Owen and working through some shorties like my Jem and the Holograms single-issue comics and the annual. Pumpkin cheesecake cookies! Thank you, Amanda! I host this thing along with Heather from Capricious Reader, and we live together on Facebook messenger. We also enlist hundreds of volunteers, and I like guacamole. But also bigger yay for hosting the readathon, you do such an amazing job. Have fun!! I have JEM from NetGalley but haven't had a chance to check it out yet. Yay! You and Heather are the Queens of Hosting. Do you have clones? You and Heather are doing a fantastic job as our esteemed leaders! I wanted to thank you and Heather for all you do! I really enjoy the read-a-thon. Thank you for keeping the tradition going! OMG - pumpkin pecan cobbler and pumpkin cheesecake cookies! I could die happy. Over 2000 readers? That's crazy! It's because you guys make this so much FUN. That cobbler looks delicious! Keep up the good work! You're nearly there! A+ job, as always. Y'all are the best.